Getting there – less than two miles from the M4 makes this site easily accessible. Leave at junction 48 on to the A4138 heading towards Llanelli and at the first roundabout follow the brown tourist signs. Be sure not to miss the entrance to the site though as the road narrows considerably soon after! Take a look at our Site Arrival video below. The entrance road is narrow and this is one of the reasons new arrivals are normally asked to arrive after 2pm, with departures being by midday. However they will gladly send you a text when your allocated pitch becomes free and you can then turn up when you wish. On arrival you will be greeted by Hywel or Cathrin – brother & sister co-owners. They will show you where everything is, provide a comprehensive information park, including Welsh tea & coffee, then direct you to your pitch. Youíll often see one or other of them around the site during the day and nothing is too much trouble, whether it be advice on things to do or recommendations for places to eat. The site is tiered and the first rows – to your right as you arrive – are the seasonal pitches. 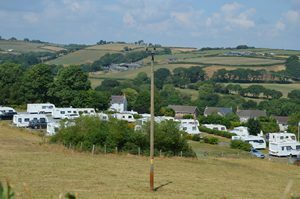 On the next level there are five hard standing pitches with 10a electricity supply and are open all year around. The top tier are fully serviced, have a picnic bench and a more commanding view. There are two rows but the rear ones are staggered so they donít miss out. The views are one of the features of this site and are very, very impressive. You will have passed the large dog exercise area to your left as you arrive then just beyond and also to the left is the facilities block with the Gents toilets nearest, to the side of which are the chemical toilet and waste water emptying points. Around the corner in another room there is a sink for washing up and then next you’ll find two spacious showers each with a sizeable changing area. The washer and dryer is here too as is a hairdryer. To the right is the Ladies toilets whilst in the house further on is Reception. A feature here in both toilets is no paper towels or hot air dryers but individual soft cotton towels. A nice touch. Please also take a look at our Site Tour video below. Ahead you will also see the well stocked information room ahead of you and Hywel & Cathrin are happy to advise on local attractions and things to do. Fruit, veg and milk can be delivered to site but the Co-Op in Llangennech is only around a mile away with some of the major supermarkets a bit further along the A4138 towards Llanelli along side a big retail park. The site recommend two pubs but we’ve only tried one – The Bridge – and that was very good. Again, around a mile from the site. So, with such stunning views it would be easy to sit all day relaxing with a good book and if thatís what you fancy then why not? But if you want to get out and about there is plenty to do. We barely scratched the surface in our two visits here but can hopefully give you some ideas. 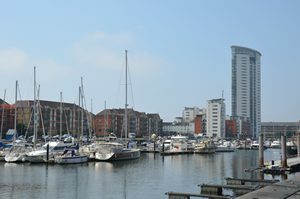 Cities may or may not be your thing but the redeveloped Maritime Quarter in Swansea, home to the Waterfront Museum is worth a look. To enhance our enjoyment we downloaded a Treasure Trail from www.treasuretrails.co.uk. It takes you on a walk of around two miles giving clear directions and clues which you need to solve. Good fun and we learnt a bit too. A drive (or bike if that’s your thing) around the Gower peninsula is a must do in my opinion. 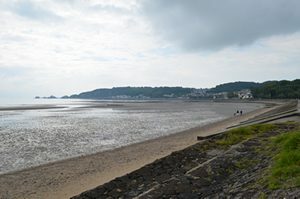 Park up around Oystermouth and take a walk along the promenade to enjoy the views of Swansea Bay. 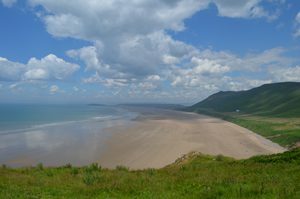 Continue around but be sure to call in at Rhossili for some jaw dropping views. If the tide is out you can walk out to Worms Head too. The area is under the stewardship of the National Trust so have your membership cards ready or some change for the car park. The Millenium Coast Path visitor centre is good starting point for said path and just fifteen minutes drive from the site. 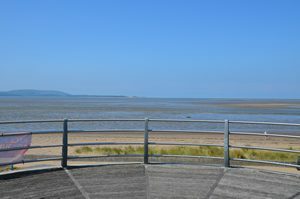 The cafe on the first floor gives great views over the bay and along the path – open to both cyclists and pedestrians there are are wheelchair accessible raised platforms and partially enclosed seating areas so you can still enjoy the view when the weather is not so good. Further around you will find Burry Port and it’s harbour. Now given over to leisurecraft, coal used to be shipped from here whilst in came things like copper and products essential for the operation of the mines in the area at the time. 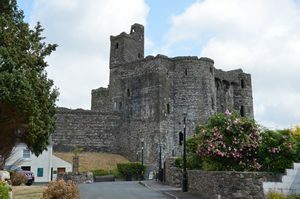 Further around still is Kidwelly – and whilst the town itself is a pleasant enough place, the star of the show here is undoubtedly the castle . 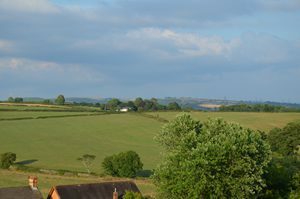 Just four pounds for adults (July 2018) and it’s a great place to explore and a good way of admiring the surrounding countryside. It can be uneven though in places so If you going to climb the narrow stairways, wear something grippy on your feet. 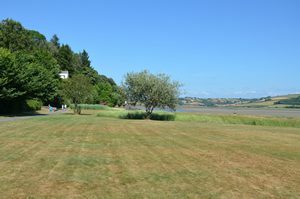 A few miles around past Carmarthen and on the western edge of the county is Laugharne which shamelessly plays on it’s Thomas Dylan connections. Dylan’s Boat Yard and Writing shed are here but even if you have no interest in Mr D it’s cracking place to visit. Whilst there are plenty of dining options you could bring a picnic and chairs and just drink in the views over the mouth of the river Taf. One of the most idyllic places we’ve visited on our travels. There’s castle here too as well and it’s location promises terrific views too.